A native of Chicago, Illinois, Anne Marovich practiced law in Chicago for six years before moving from Illinois. After moving to Alabama in 2002, she practiced long distance for a Chicago firm for two years prior to joining Samford University. She originally joined Cumberland School of Law in 2007 as the associate director of the Office of Career Development. This role was her entry into higher education. 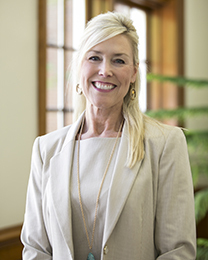 Since 2010, she has been leading the Office of Alumni Relations as the director. Marovich and her husband, John, have two daughters.